The model 4605 is a low cost open printed circuit board time delay relay, that combines the accuracy and reliability of digital circuitry, with a DPDT10 ampere relay output. When voltage is applied, the 4605 starts timing with the relay de-energized. When the preset time period has elapsed, the 4605 energizes the output relay. 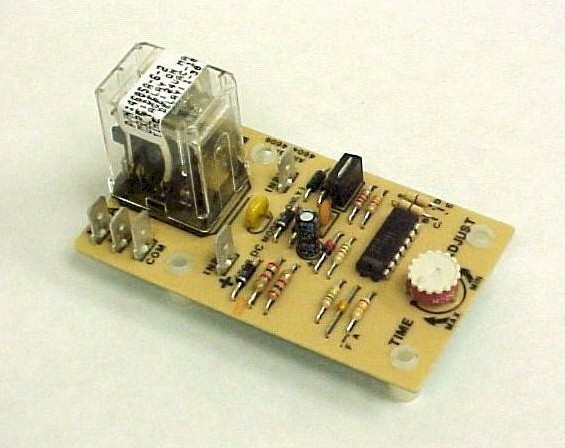 The relay remains energized as long as the input voltage is applied to the timer. This unit is available in both a fixed or adjustable timing option. Operating Voltage 12, 24, 48, 110V DC, 24, 48, 120, 230V AC, 50 / 60 Hz. Timing Range Fixed units-.1-2000 Seconds, Factory Set . Adjustable units - Five ranges from 0.1-900 Sec.